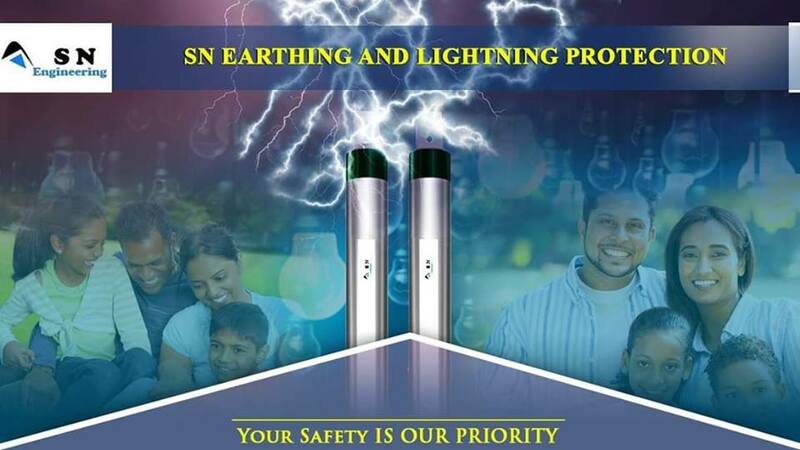 We Are SN EARTHING AND LIGHTNING PROTECTION. We are a company which believe in Earthing Solution. We provide Earthing Solution related to Electronic Card Failure. We Provide Earthing Solution of Shop Floor, Paint Shop, Electronic Earthing Solution, Electronic card failure, we Provide solution of Less than 1 ohm. We provide earthing solution on 1st floor , 2nd floor. We design your earthing as per your application requirement, we do not believe to supply earthing randomly. some time it harms the application as well. is it Transformer Earthing, DG Earthing , Lift Earthing, Neutral Earthing or any other Sensitive earthing, the sensitivity of earthing vary according to its application. S N Engineering S N Engineering has become a name to reckon with for supplying their clients a top notch quality of Chemical Earthing Electrodes in Delhi . These are wide appreciated by our esteemed clients for their superior performance and world class quality standards.we are also a noted supplier of products like E.S.E Lightning Arrester , Chemical Earthing Electrode & Copper Wire Cables.We work with zeal to impart highly innovative and cost effective solutions to meet the all round earthing requirements of our valued clients. The assortment of our chemical earthing electrodes and other precision engineered products is known for good conductivity, corrosion resistance, low maintenance and safe operations. We cater to a diverse segment of industries and have formed a wide client base. We move ahead with a vision to spread our wings globally and create a niche for ourselves in the global market. Our sole vision lies in growth and a thorough client satisfaction by supplying our clients with the best quality products and earthing services. An earthing system in any kind of electricity systems ascertains the electrical potential of the conductors which are relative to those elements of the conductive surface of the earth. It finds various implications in electromagnetic compatibility and safety of the power supply. It comprises various earth connections such as functional and protective earth. The former provides a protection against electric shock whereas the latter ensures a balanced electric potential of all the exposed conductive surfaces. Thus, to facilitate a shock proof and smooth functioning of your electronic systems, an extensive earthing system is a prerequisite. Earthing is used in devices such as electromagnetic interference filters, surge suppression and many kinds of antennas.